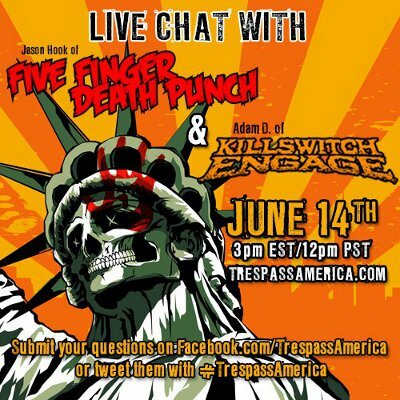 Adam D. of Killswitch Engage and Jason Hook of Five Finger Death Punch will both take part in a live chat today (June 14) at 3PM EST over at www.trespassamerica.com. 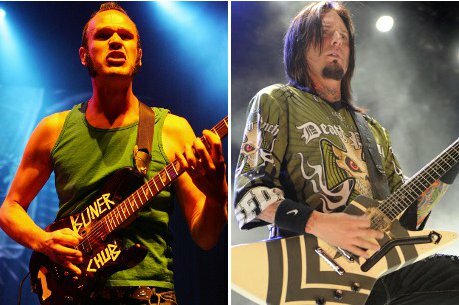 The guitarists will be discussing the upcoming Trespass America tour which will feature headliners Five Finger Death Punch and Killswitch Engage, along with Trivium, Emmure, God Forbid, Pop Evil, and Battlecross. The 24-city trek will kick off on July 13 in Broomfield, Colo. and concludes on Aug. 28 in Hollywood, Calif. Check out the Trespass America tour dates below.